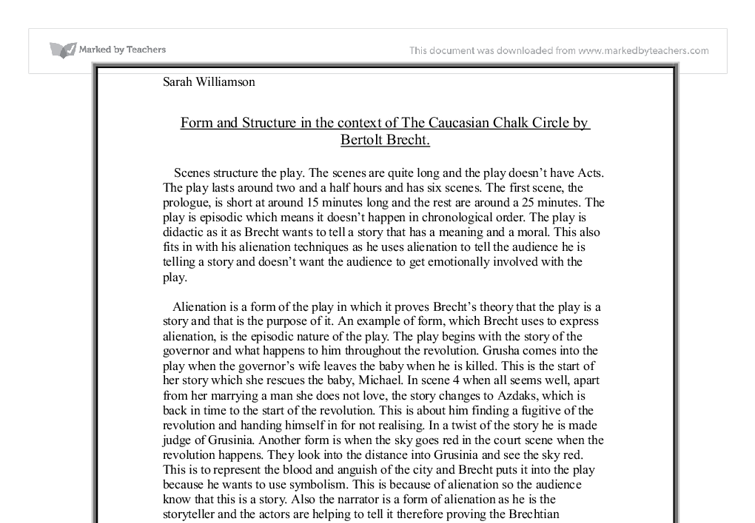 Form and Structure in the context of The Caucasian Chalk Circle by Bertolt Brecht. Scenes structure the play. The scenes are quite long and the play doesn't have Acts. The play lasts around two and a half hours and has six scenes. The first scene, the prologue, is short at around 15 minutes long and the rest are around a 25 minutes. The play is episodic which means it doesn't happen in chronological order. The play is didactic as it as Brecht wants to tell a story that has a meaning and a moral. This also fits in with his alienation techniques as he uses alienation to tell the audience he is telling a story and doesn't want the audience to get emotionally involved with the play. Alienation is a form of the play in which it proves Brecht's theory that the play is a story and that is the purpose of it. An example of form, which Brecht uses to express alienation, is the episodic nature of the play. ...read more. The play is didactic, which means the play has a moral and is a story so it teaches. Brecht makes sure the audience know this is didactic through alienation, the episodic nature of the play, the narrator and the guest. The teaching and moral of the play is "the children to the maternal that they thrive" which means love is the maternal link to a child. This is shown in the end scene when the play comes to a close. Azdak, who is judge, draws a chalk circle as he cannot decide who should have Michael. He tells the child to stand in the centre and the two women, Grusha and the governor's wife, and tells them to pull Michael. The person who pulls him out keeps the child. Grusha lets go and does it when the task is asked to be done again. Azdak knows Michael is the governor's child yet he wants the best for the child. Azdak then knows Grusha is maternally the mother of the child and he grants Grusha to keep him. ...read more. He is then made judge in a twist to the story in scene 5. We find out that the revolution is happening at this time when the ironshirts point out the revolution. This is portrayed by red sky to show blood. The two characters meet at the end during a court case, which Grusha and the Governors wife are battling for custody of Michael. We showed this by using red lights on the stage to show the red sky every time the scene was set in the time of the revolution. We also used placards to show this. 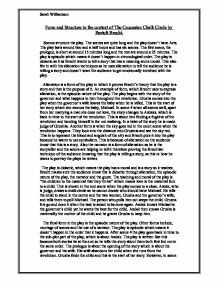 This form would effect the audience in a way that Brecht uses a lot which is letting the audience know that the play is a story told by actors and to make sure the audience do not get to involved emotionally with the characters. He does this, as he believes this is how a play should be acted, as it is a story. This affects the audience as they don't get emotionally involved in the play and find a moral out of the story. ?? ?? ?? ?? Sarah Williamson ...read more. We see the same optimism in other characters that we see in Doris at this point "I'm so happy, SO HAPPY!" This is a Brectian technique which relates to alienation. This technique also gives the audience chance to become critical themselves of the performance and decide what the characters are feeling. The singer is quite a loud, over the top exaggerated character and shows this through the style of acting used. The actors constantly involved the audience by directly speaking close up to them as if the line was meant for only them, the strong and constant eye contact was extremely powerful and the casual exchange of props between the two, all gave a very intimate relationship. So based on this, are they not entitled to a second chance? This is the point Phillip makes very early on in the play, as the voice of reason amongst the officers, when he tells the officers "how do we know what humanity lies hidden under the rags and filth of a mangled life?" This could be a technique used by Brecht, to convey to the audience that there are no underlying ideas to the plot and remind them that this play does not take the form of other conventional plays that adopt the technique of Aristotelian or dramatic theatre, but rather uses the epic theatre technique. The methods used in 'Mother Courage and her Children' produced an alienating effect, and separated itself from the conventional attributes of theatre, which appealed to the audience's emotions and evoked empathy, causing them to share the characters feelings. Epic theatre, by definition, resolves to engage people's thinking and reasoning. them, more and more is revealed about them and their relationships and about their tragic past. The theme of relationships does connect with the audience very well as everyone at some point experience a relationship with someone whether it is good or bad one. Both Mother Courage and solider do not make their complaints. Brecht is telling us that during war normal fairness doesn't exist. This is show by the solider wanted to get paid for saving the colonel's horse but instead he gets nothing.